The webinar will share data about schools that currently use two-factor authentication on email and about their use of hard drive encryption (both Mac and Windows OS), discussing why each is important and providing tips and advice for implementation. For example, did you know that 75% to 90% of cyber incidents begin with an email? Cyber security requires an all-school effort. So, first, technology leaders should take the step of forming a team to work with colleagues and other offices to identify and implement cyber security strategies. Teams then develop a training program that incorporates specialized training for different roles. Then, just as other administrators plan and implement emergency drills, so must tech leaders regularly run simulated phishing attacks. In our constantly changing world, tech leaders must make every effort to understand the evolving threat environment. One step involves measuring and probing your school’s risk tolerance. 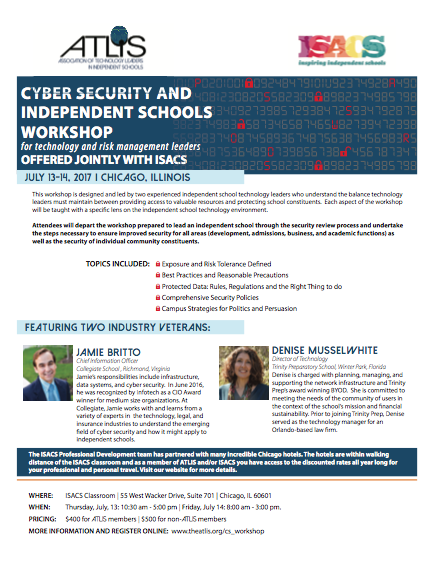 Consider exploring cyber security insurance as a way to help your school develop its own Threat Assessment and Mitigation Strategy. As you begin the process of implementing cyber security for your school, here are some resources to help you get started. Join our webinar for a thorough introduction to these and other materials. Comments on "Cyber Security: Where to Start?"